When the mind clicks on the word TANJAVOOR, the magnificent picture of PERIA KOIL or BRIGADEESWARA temple looms before my eyes. My next thought associated with Tanjavoor is Hotel Karthik where we had halted for a coffee break during one of our visits. Our ears pricked up at the mention of “special cashew dosai” when the bearer rattled out a long list of available dishes. We waited for our order, all the while guessing what this dosa was all about, though we knew that cashews and ‘gundu milagais’ (a small round variety of chillies) were Tanjavoor specialties. Dibs who was only twelve years of age then even wondered whether they would have ground the batter with cashew nuts! 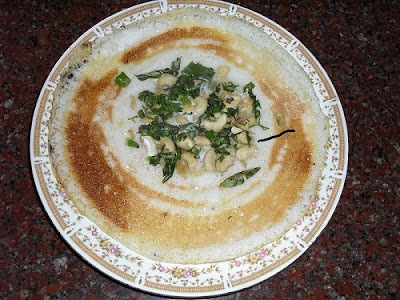 Though the innovative special dosai surprised us it was really delicious with the accompaniment of sambar and chutney. TO MAKE THE BATTER1. Soak rice, urad dal, tur dal, fenugreek seeds, and beaten rice for two hours. 3. Mix in salt and sugar. 4. Cover and let it ferment over night. 1. Grease and heat the tava. 2. Pour a small tbsp of batter, dribble little oil and cook the first testing dosa. 3. Making sure that the tava is evenly heated pour a ladle full of batter on the center of the tava. 4. Leave a palm size of batter in the middle and spread the batter thinly around the circumference. 5. When small holes start appearing sprinkle a generous portion of the cashew topping mixture on the central thick portion of the dosa. 6. Dribble oil around the dosa and cover only the central portion with a small lid. 7. Cook until the golden colour of the roast is visible around the lid. 8. Remove the lid and dribble a spoon of ghee on the dosa. 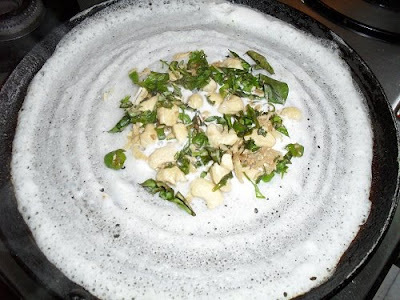 Enjoy the flavoursome Tanjavoor special cashew dosai with coconut chutney and onion sambar. Boondi Laddu is a sweet prepared on all auspicious occasions and feasts. Wedding ceremonies and temple festivals seem incomplete without the traditional Laddus. 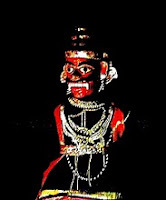 A pilgrimage to Thirupathi is consummate only after the devotee has savoured the Thirupathi Laddus as prasadam. Every year we have a Vijayadasami procession for the family deity - Lord Sri Rama - in our native village. Rukmani prepares 8 Kgs of the customary Sundal for distribution after the pooja. We usually carry Laddus from a reputed sweet stall at Bangalore to distribute with the Sundal. On one such occasion there was an unexpected surge of devotees and to our utter discomfort we sensed a shortage of laddus. Our manager's nephew Mani shocked all of us when he suddenly punched four or five times into the Laddu basket crumbling all the Laddus into mere boondies! We were all smiles when he efficiently distributed the sweet boondies in smaller portions to one and all who had gathered at the temple. We thanked smart Mani for his presence of mind and to this day we buy only Tidippu Boondies when it came to distribution of sweets for any occasion. Tomorrow being Rama Navami, I prepared Sweet Boondies to celebrate Lord Sri Rama's birth day. 1. Add water little by little to the besan and make a thick and smooth batter, similar to dosa batter. 2. Take a heavy bottomed vessel and add sugar and one glass of water to it. 3. Add two tsps of milk to sugar and water mixture and continue to boil. 4. Remove the scum from the top with the help of a spoon thus cleaning the syrup. 5. Heat oil side by side in a kadai on the second burner of the stove. 6. Add colour and cardamom - camphor powder, and reduce flame when the sugar syrup becomes sticky. 7. Take a perforated ladle ( jarani) and hold it about 2 to 3 inches on top of hot oil. 8. Pour a cup of batter on the perforated ladle and gently tap the rim of the ladle, so that drops of batter fall into hot oil. The boondie drops will rise to the top immediately. 9. 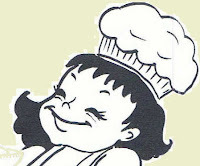 Drain the boondies when they stop sizzling and add it to the sugar syrup. 10. Switch off the flame under the sugar syrup to avoid crystallization. 11. Fry all the batter into boondies and add to the warm syrup. 12. Fry cashew nuts, raisins and cloves in ghee and mix into the boondies. 13. Spread the sugar soaked boondies on a plate and cool. Share your joy and the golden yellow sweet boondies with your loved ones on all happy occasions. Lavish and traditional Indian weddings are celebrated with various ceremonies spread out through five days or at least for three days. Every meal is an elaborate spread with many dishes accompanied by a special sweet. Damroot has a prominent place in the breakfast spread of a wedding feast. It is usually prepared with ashgourd and is also known as Kashi Halwa. A famous sweet stall - Bhaghat Ram's - at Bangalore has created a novelty by using carrot instead of ashgourd, and the thought of the Carrot Damroot makes one drool and crave for the exotica! 1. Wash and scrape the carrots. 2. Pressure cook whole carrots along with milk. 3. Mash the cooked carrots using the back of the ladle, or a potato masher and blend well. 4. 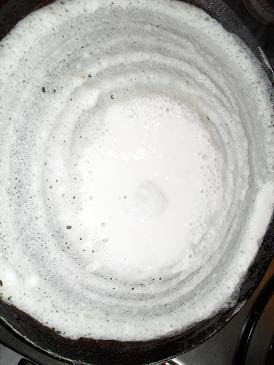 Transfer the carrot-milk mash to a heavy bottomed kadai (or you can continue cooking in the pressure cooker without the lid, and save washing up one more vessel!!) and cook till the milk evaporates. 5. Add the saffron strands, sugar, ghee and cardamom powder and blend well. 6. Pour this mixture into a greased foil tray or a flat baking tin. 9. Preheat the oven for about 15 minutes. 11. Bake the carrot mixture at 180 degrees in a fan forced oven for about 40 minutes, or until the top starts browning. 12. Remove the tray and decorate with almond flakes or cashew nuts, and bake for another 10 minutes. Nothing so delicious as serving it straight out of the oven , with the lovely caramelized reddish brown colour on top the dish, along with a scoop of vanilla ice cream! 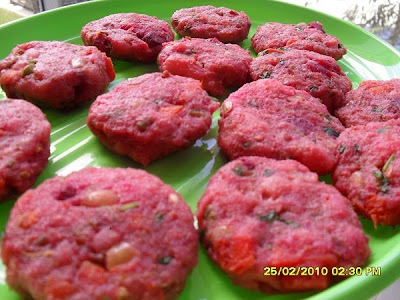 As children we had tasted Vegetable Cutlets for the first time when father took us on long tours during our holidays. That was the only time when we were off 'home food' for so many days, and virtually 'Ate out', every meal, everyday. Father taught us how to eat the piping hot cutlets using a fork and knife. We thoroughly enjoyed the experience, eating a strange but yummy snack, in a strange ambiance, using stranger instruments! The origin of the cutlet is attributed to many countries, but this lip smacking snack has entered all households in various avatars, containing diverse ingredients. Vegetable cutlets have a special place even in the most traditional and conservative of kitchens in South India. In fact, I was astonished and pleasantly thrilled, when vegetable cutlets were served instead of vadais in a traditional feast served on banana leaves, at a friend's place soon after my wedding. Amused by my fascination for Cutlets, my husband made it customary to stop at 3ACES, a popular restaurant on M.G.Road in the 1960s - 70s, during our evening drives. The taste of the gorgeous cutlets which were served with an assortment of salad vegetables and mint chutney still remains fresh in my mind. This nostalgia was triggered off by just looking at the yummy vegetable cutlets my daughter had prepared two days ago, for a party. 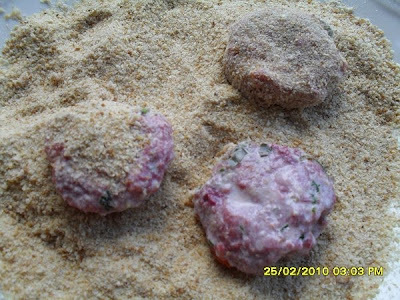 The beetroots and peanuts which she had included in the recipe, rendered a special taste to her cutlets. 1. Pressure cook potatoes. Peel them and set aside. 2. Peel and chop beetroots and carrots. String the beans and break into small pieces. 3. Boil the chopped vegetables and peanuts with just enough water, until they become soft. (Or cook to three whistles in a pressure cooker). The vegetables should be completely cooked, but not mushy. They should retain their individuality in the cutlets. Allow the vegetables to cool well. 4. To prepare the seasoning, heat 1 tbsp of oil in a kadai and add cumin seeds, grated ginger, chopped green chillies, followed by coriander powder, star anise powder. 5. Switch off the flame, and add the coriander leaves, salt, pepper powder (and the optional lime juice) . The seasoning is now ready. 10. Add potatoes to the seasoning, and mash and mix well with the prepared seasoning. 11. Next mix in the cooked vegetables and peanuts with the potato mixture. 13. Make a thin batter of water and corn flour in a deep vessel. 15. Dip the cutlets in the the batter one at a time, and place the coated cutlet on the bed of bread crumbs. Cover the cutlet well with the crumbs on all sides keeping the shape in tact. 16. 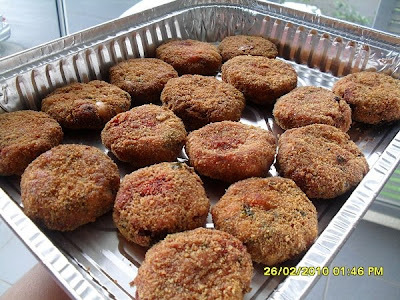 Arrange all the cutlets with out overlapping, on a flat tray and place in the refrigerator. 17. You can keep the cutlets in the fridge for at least for two hours, or till you are ready to serve them. This will allow the cutlets to firm up, making frying easier. 18. When you are ready to fry the cutlets, heat oil in a heavy bottomed vessel. 19. We used 1/2 liter of oil in a large kadai. Slide in four cutlets (or more if the vessel has space) at a time into the hot oil. 20. Using a ladle take the hot oil from around the cutlets and pour on top of them and cook for at least 3 minutes without disturbing the cutlet. 21. Gently flip over and cook on the other side of the cutlets. When the cutlets are evenly browned on all sides to a copper brown in colour they are ready. 22. .Remove them onto paper towels to drain out excess oil. Serve the cutlets hot and crisp with fresh mint chutney and tomato sauce.